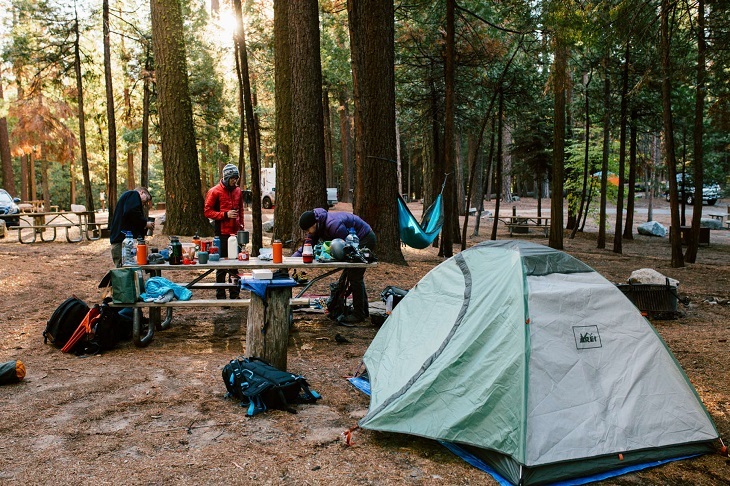 The 5 Best Campground In Yosemite - Find Out Now! 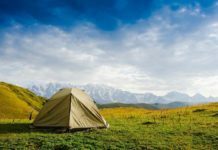 Home Campgrounds The 5 Best Campground In Yosemite – Find Out Now! There are always places where suit best for you, especially as they seem close to the park’s sights and sounds. And camping in Yosemite is one of the best spots to experience the breathtaking views of nature. However, camping in Yosemite in peak season like July and August could be a challenge since the best campground in Yosemite will be soon filled up. So if you desire to camp in the area, reserve a campsite in advance within 30 minutes of being available. And remember that “the first come, first served” on the weekends during the peak season. Just point out these 5 of the best campgrounds while you’re driving through Yosemite. Visiting here once, you’ll notice all the 60 campsites specially made for single families with the essential facilities provided. There are tables for picnic, fireplaces, flush toilets, piped water and much more. But the campsite won’t have any camping cooler available for you, so please bring them along if your trip lasts two or three days! 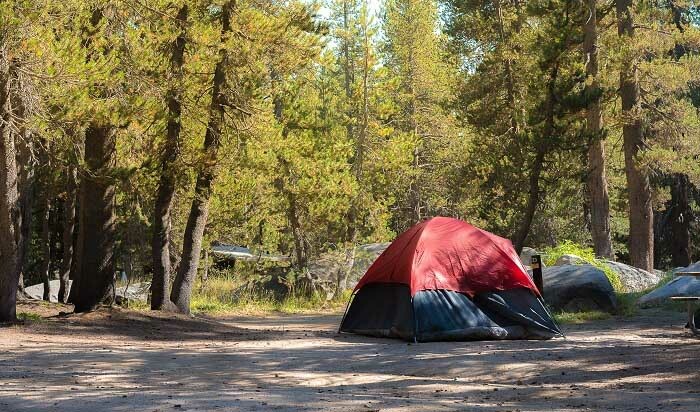 Find your best campground in Yosemite nearby the banks of the Merced River, where is an ideal spot to catch the most striking views of the Half Dome. This is popular as the rock formation with a unique shape, which appears like the dome sliced in half. And the granite crust just increases more than 1,444 meters above the valley floor. Before enjoying your outdoor adventure in this area, make sure to reserve your campsite in advance as soon as possible. Pay $36 for each campsite here, which can hold from seven to twelve people. Note that the campground won’t have any sewer hookup, but only one dump station nearby. Bigger is always better, right, and the same just go with the Upper Pines Campground, the best campground in Yosemite this time. How come? It’s because there are 238 campsites available all in one area, wow! No wonder why it’s one of the most favorite campsites in the valley, which is partially thanks to the incredibly amazing views of the iconic scenes surrounding. But it can become very crowded, so before hanging your hammock, make sure to prepare yourself mentally. Also, the campers get to enjoy the best facilities from this campground, including the fireplaces, one food locker, picnic tables, food lockers, flushing toilets, and one bathroom per site. Well, not many of these sites can offer you such equipment, making this place a worth-to-go for everyone! Also, pay attention to the ﻿regulations here: Six people (kids included) are enabled for each campsite, not for the group, which include thirteen or thirty people. Once coming to Wawona Campground, which lies in the beautiful Yosemite National Park, you’ll see several exotic things! They’re the big trees having cool names like Faithful Couple or Grizzly Giant. But if you love the waterfalls more, there are also the Chilnualna falls here, and it’s only a short ride away. 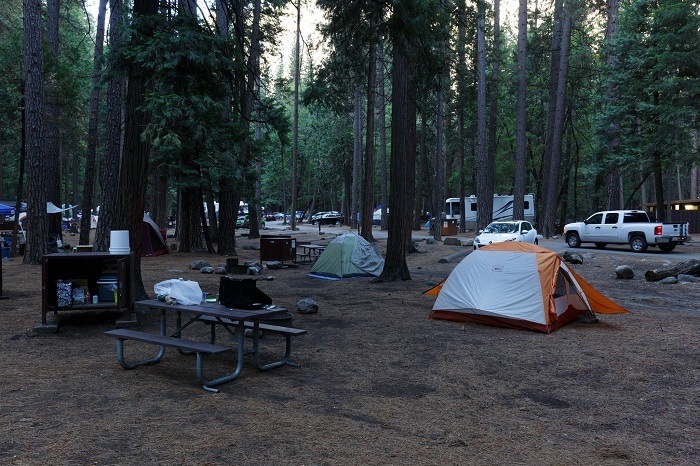 Known as the best campground in Yosemite, Wawona is exactly the big home to the wild nature. Within the place, as a visitor, you get to see many beautiful things growing in nature, such as deep valleys, giant sequoias, waterfalls, granite cliffs, meadows, one wilderness area, and more. Give it a try, guys because it’s not just a wonderful place to enjoy your day outside the house, but also a serene site to have a coffee with your lover. If you’re lucky enough to stay nearby the Merced River, you will get to sleep peacefully at every night. But before that, ensure to prepare your sleeping bag beforehand! 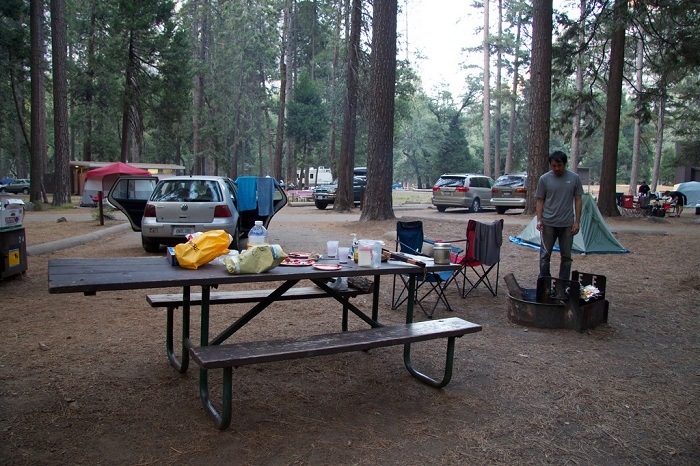 After all, we highly recommend Wawona campground to everyone if you get a chance to come here! Stretching about sixteen miles from Wawona campground to Glacier Point, you will be arriving at another awesome campsite. It provides us with the impressive sights of the Half Dome, Nevada Falls, and a lot others well-known landmarks. And sure enough, there might have never been such a better place than this one - the best campground in Yosemite! It’s set along the Bridalveil Creek that flows into the fall, showing off such an unforgettable beauty in the eyes of the beholders. Also, nearby this nice place, your campground is just far from any valley crowd, which lets you enjoy the peaceful moments with your family. 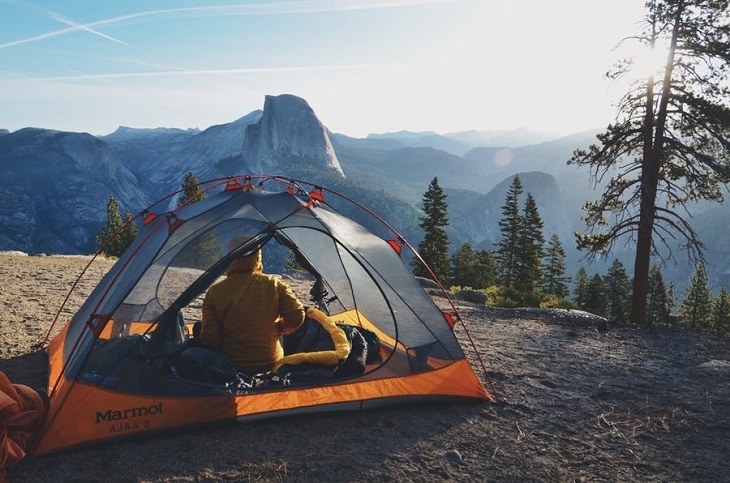 If you want to go on a romantic camping with your lover in Glacier Point, it would be a great idea but always have a plan before getting started! Last but not least, every winter trip could be made from Glacier Point Road for a super scenic experience. It’s going to be a hushed attraction that is not only intimate but also wild, making your whole campsite more magical and amazingly accessible! As I said, planning a trip to Yosemite will never be disappointing, especially when it’s different and way too much of a special spot to ever be unsatisfying. Let’s head to the last or the best campground in Yosemite I’d like to recommend to you here - the Hodgdon Meadows. This is when you have a chance to see the falls from the tunnel view, which is one of the first ones to get dried up during the summer. The trails are not long and not too steep after all, so it’s a good place to visit and experience a couple of great things. How about having an easy and calm dinner on the first night here and then had a great fire? Choose to sit around that campfire and then share the happiest experience with your friends and family. Once the bed time comes, you might love to take out your camping cot to fall asleep in the gentle breeze. If not, you can get inside the tent in case it rains outside. Note that the remaining campsites at Hodgdon Meadow are only available on the first come, first served rule. It means that you must reserve a campsite before the trip! For those who don’t know, there are many fabulous places to stay overnight in Yosemite National Park’s campsites. 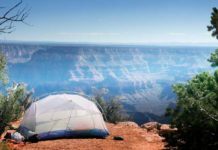 And today, we list the top 5 of the best campground in Yosemite in this article for you to choose and to enjoy the heart of the valley to the fullest. But note that all reservations are necessary here since all of the campgrounds are both on the first-come, first-served basis from April to September.